This article provides removal instructions that will help you to remove Check Weather Chrome extension entirely from the affected browser and Windows system. 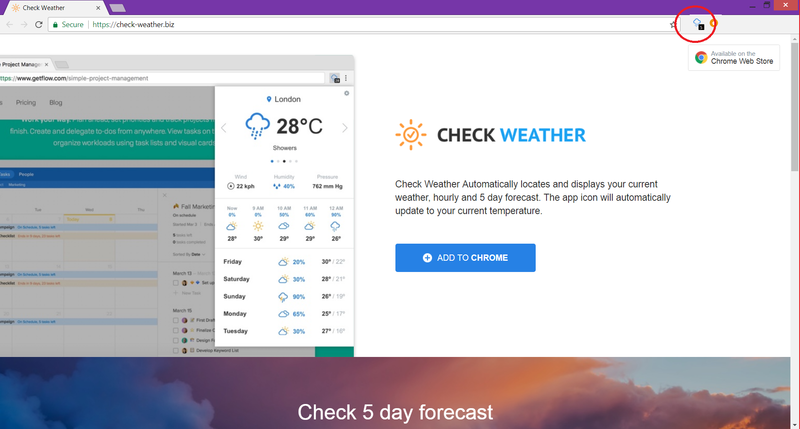 Check Weather is a browser extension for Chrome that can hijack your web browser without your knowledge. It promises to deliver instant weather forecast based on your location and a preferred temperature scale. At first, you may find the extension useful, but once you have it in the browser, you may notice an increased number of annoying advertisements that diminish the overall browsing performance. Furthermore, as long as Check Weather has access to your browser it may obtain specific details about you and your online behavior. To prevent it from causing some privacy-related issues you need to delete it from the affected device. Short Description The suspicious Chrome extension Check Weather can be installed in your browser without your consent. Symptoms Many redirects and advertisements can occur during browsing sessions. User Experience Join Our Forum to Discuss Check Weather. The Check Weather Chrome extension may sneak into your system with the help of various shady distribution techniques. It is good to begin with mentioning third-party installers, as they are most preferred by malicious intenders. The installers of third-party apps can be easily compromised to deliver potentially unwanted programs like Check Weather without your knowledge. Happily, in some cases the undesired installation of such hijacking extensions is preventable. How? Usually, the installers provide Advanced or Custom configuration options where you are able to see whether some additional components are set for installation or not. If you find any apps that you don’t want just deselect them and then continue with the installation of the primary app. 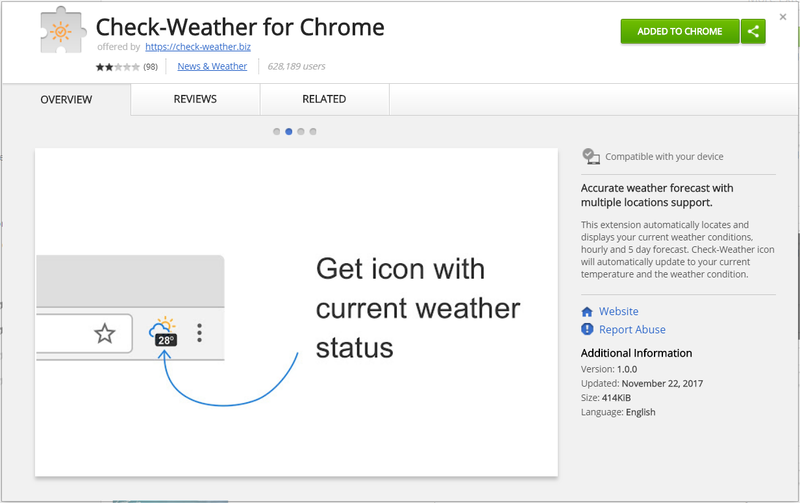 As another way of distribution is used a website associated with Check Weather Chrome extension. It has the domain address check-weather.biz. A visit to another compromised website may redirect you to the home site of Check Weather. Furthermore, the extension is available in Chrome web store. However, as these two spread techniques require a conscious decision for the installation of the extension, they are less likely to be the reason why Check Weather appears on your browser. As you have probably noticed already, Check Weather is a nasty browser extension that lands on your system without your consent. Once it has access to your device and browser, it may alter important browser settings in order to ensure its persistent access to the data stored by your browser. Check Weather pretends to deliver instant weather forecast based on your location and a preferred temperature scale. 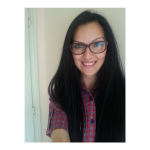 At first, the app may mislead you that it is reliable and useful but after a while, it may start to deliver a lot of annoying online advertisements of all kind. You may see banners, pop-ups, pop-unders, videos, new tab pages, images and other types of ads all over your browser. The ads may be extremely intrusive which is likely to slow down the performance of your browser. It can even crash at times. The ads you see are likely to be based on your online preferences which Check Weather can easily acquire once installed in the browser. If you want to prevent the intrusion of severe malware infections be advised to avoid clicking on any ads generated by the suspicious Check Weather extension and better remove it from your system as soon as possible. If you do not agree with the collection of such sensitive data and want to keep your online privacy safe follow the removal guide below. Below are listed all the steps that will help you to remove Check Weather completely from an affected browser. The guide includes steps that reveal how to remove the nasty program from the Windows system as well. You can choose whether to follow a manual or an automatic removal. Once you complete the manual removal some leftovers may remain on the system so you need to check out whether your PC is safe or not. With a scan of an advanced anti-malware tool, you will be able to locate all harmful files and remove them completely from the PC. Threats such as Check Weather may be persistent. They tend to re-appear if not fully deleted. A malware removal tool like Combo Cleaner will help you to remove malicious programs, saving you the time and the struggle of tracking down numerous malicious files. Threats such as Check Weather may be persistent on your system. They tend to re-appear if not fully deleted. A malware removal tool like SpyHunter will help you to remove malicious programs, saving you the time and the struggle of tracking down numerous malicious files. Note! Your computer system may be affected by Check Weather and other threats. SpyHunter is a powerful malware removal tool designed to help users with in-depth system security analysis, detection and removal of threats such as Check Weather. 1. Install SpyHunter to scan for Check Weather and remove them. 2. Scan with SpyHunter, Detect and Remove Check Weather. Ransomware infections and Check Weather aim to encrypt your files using an encryption algorithm which may be very difficult to decrypt. This is why we have suggested several alternative methods that may help you go around direct decryption and try to restore your files. Bear in mind that these methods may not be 100% effective but may also help you a little or a lot in different situations. Note! Your computer system may be affected by Check Weather or other threats. Remove Check Weather by cleaning your Browser and Registry. Fix registry entries created by Check Weather on your PC. Combo Cleaner is a powerful malware removal tool designed to help users with in-depth system security analysis, detection and removal of threats such as Check Weather. Step 5: In the Applications menu, look for any suspicious app or an app with a name, similar or identical to Check Weather. If you find it, right-click on the app and select “Move to Trash”. Step 6: Select Accounts, after which click on the Login Items preference. Your Mac will then show you a list of items that start automatically when you log in. Look for any suspicious apps identical or similar to Check Weather. Check the app you want to stop from running automatically and then select on the Minus (“–“) icon to hide it. Remove Check Weather – related extensions from your Mac’s browsers. A pop-up window will appear asking for confirmation to uninstall the extension. Select ‘Uninstall’ again, and the Check Weather will be removed. When you are facing problems on your Mac as a result of unwanted scripts and programs such as Check Weather, the recommended way of eliminating the threat is by using an anti-malware program. Combo Cleaner offers advanced security features along with other modules that will improve your Mac’s security and protect it in the future. 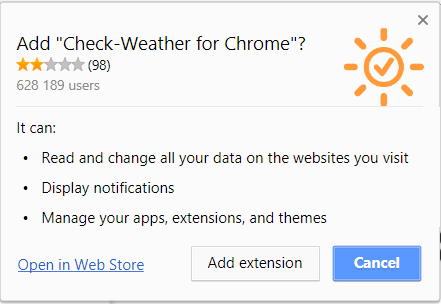 Hey !, I found this information for you: "Remove Check Weather Chrome Extension Completely". Here is the website link: https://sensorstechforum.com/remove-check-weather-chrome/. Thank you.